This new RAV4 is not new to me. 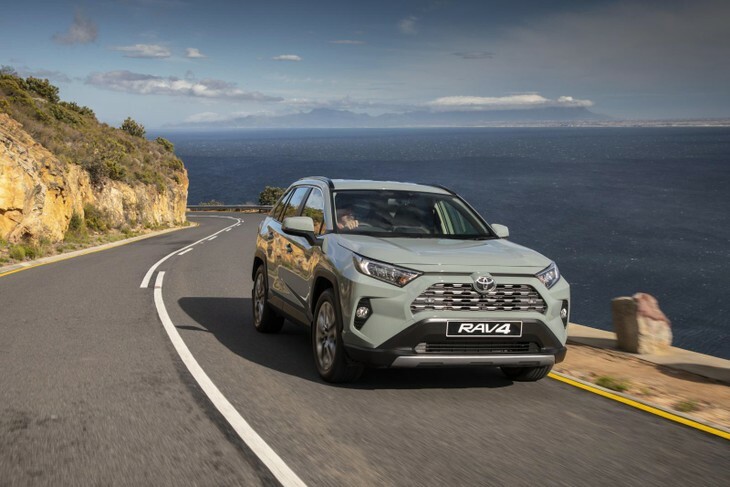 I experienced the newcomer for the first time on Spanish soil earlier this year and came away impressed, but a European driving experience is not quite the same as a South African one and I was keen to see how the RAV4 would fare on our roads. The new RAV4 features a bolder, sharper look with the GX-R being particularly striking in the metal. 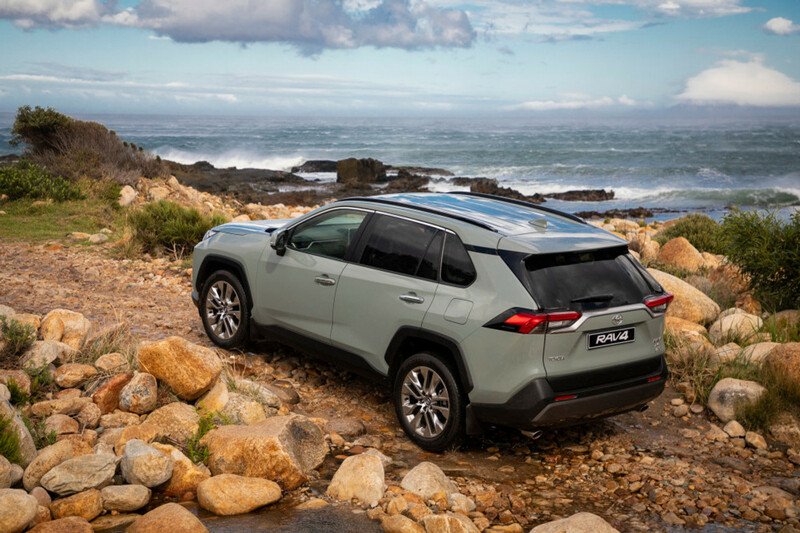 There are 5 RAV4 derivatives on offer, catering for different needs and budget, so if you are considering buying the new RAV4 you will have to consider what your needs are and how much you are willing to pay. The range starts with the entry-level RAV4 GX in front-wheel drive guise and offered with either a manual transmission or CVT. A naturally-aspirated 2.0-litre petrol engine with 127 kW and 203 Nm of torque does service under bonnet and fuel consumption is claimed at 6.8 L/100km for the manual and 6.5 L/100km for the CVT derivative. There’s also a high-spec VX derivative on offer which is only offered with a CVT. The RAV4 2.0 GX-R caters for customers looking for a beefier, mucho look with all-wheel driveability. Fuel consumption is claimed at 6.7 L/100km. 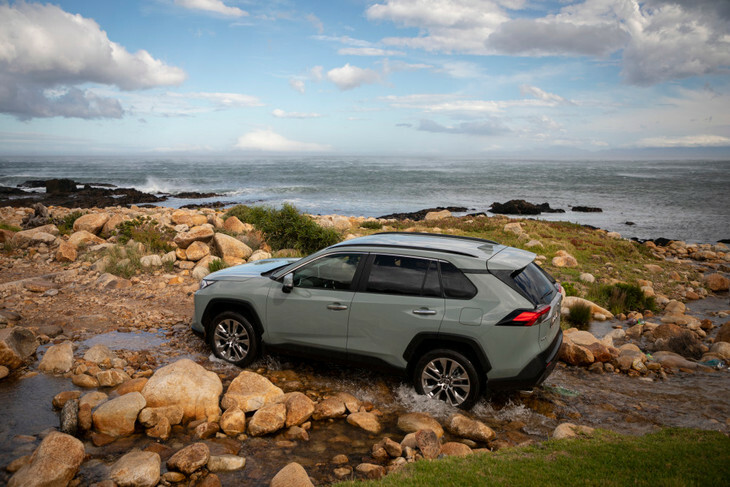 Topping the range is the RAV4 VX with all-wheel-drive which employs a 2.5-litre petrol engine with 152 kW and 243 Nm of torque. It comes mated to an 8-speed automatic transmission and carries a claimed fuel consumption figure of 7.3 L/100km. 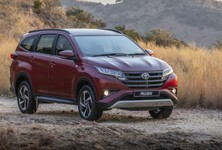 No diesel engines are offered for the new RAV4. The RAV4 copes well in moderate terrain and rides exceptionally well on gravel roads. While the RAV4 is not considered to be a 4x4 (it's more of a softroader), it does cope well on your average dirt road. 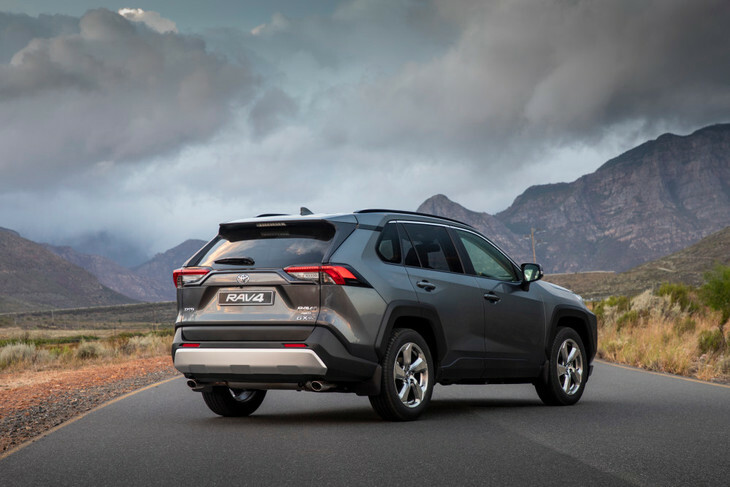 With a new mechanical all-wheel-drive system, which now features a dynamic torque vectoring system with Rear Driveline Disconnect for the first time, the RAV4 can tackle moderate terrain with relative ease. The twin couplings on the rear axle allow for torque distribution between the left and right rear wheels, which enhances traction performance in a variety of conditions. 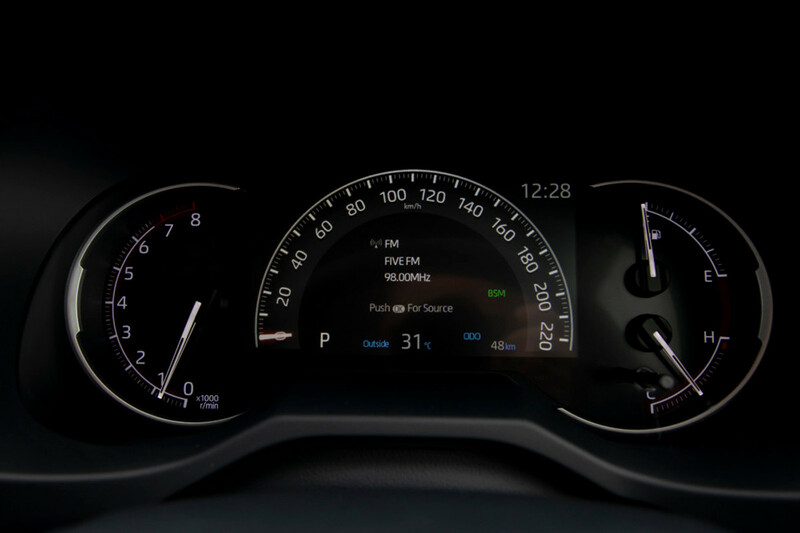 A graphic display in the instrument cluster also shows you exactly where and how much torque is being apportioned to each of the wheels, which is useful when you are tackling more challenging terrain. 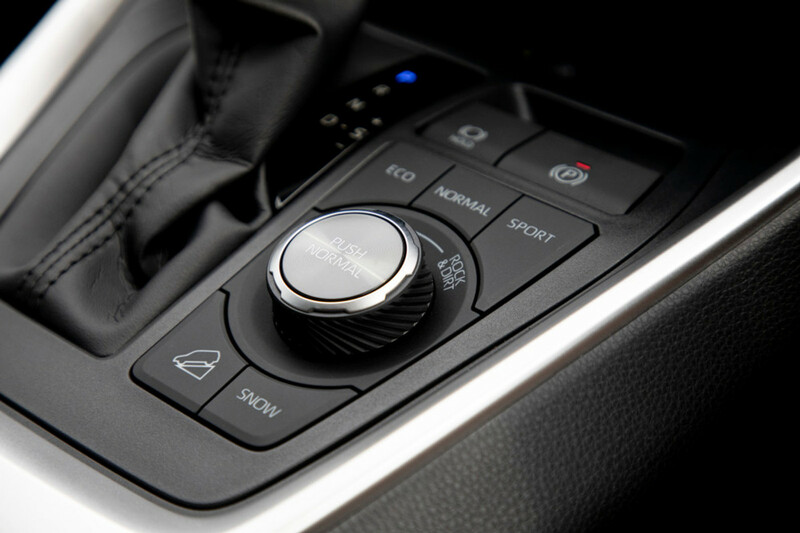 All-wheel drive derivatives are equipped with a mode dial which allows the driver to easily select modes such as Rock & Dirt and Mud & Sand, depending on the terrain. The RAV4's interior is solidly built and features an aesthetically pleasing design with good standard specification. 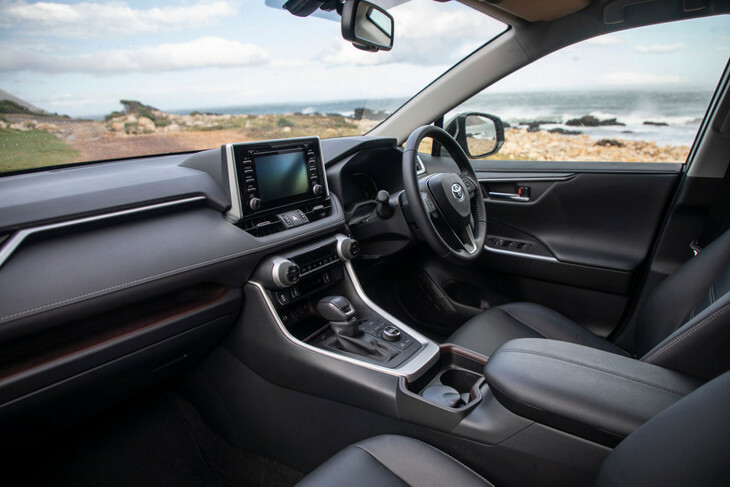 The interior of the new RAV4 is spacious and comfortable for both front and rear passengers. Perceived interior build quality is good and the interior has a solid, well-built feel to it. 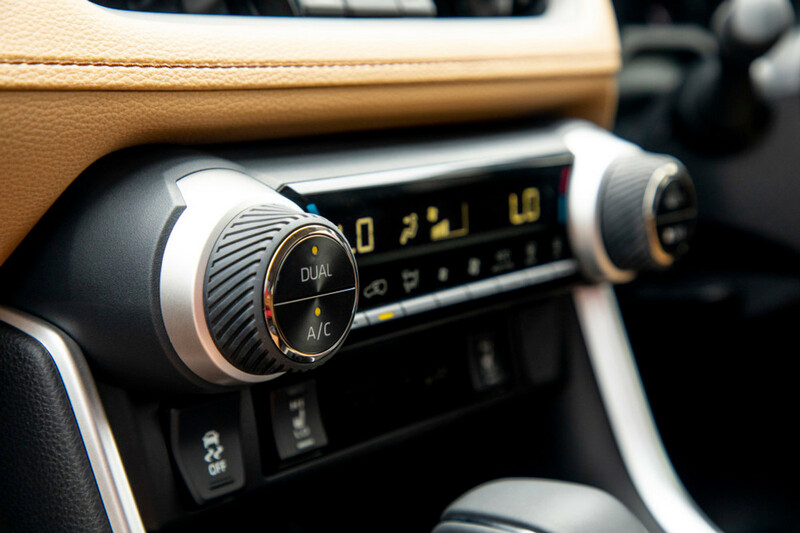 A central 7-inch infotainment system takes pride of place and while it’s easy to use it does lack Android Auto and Apple CarPlay which may disappoint some potential buyers. 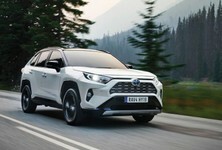 Toyota, however, is currently working on updating the system and buyers can expect an update at some stage in the future. There are some nice features such as electric seats with heating function (top-spec VX) and a rear camera is standard on all derivatives. 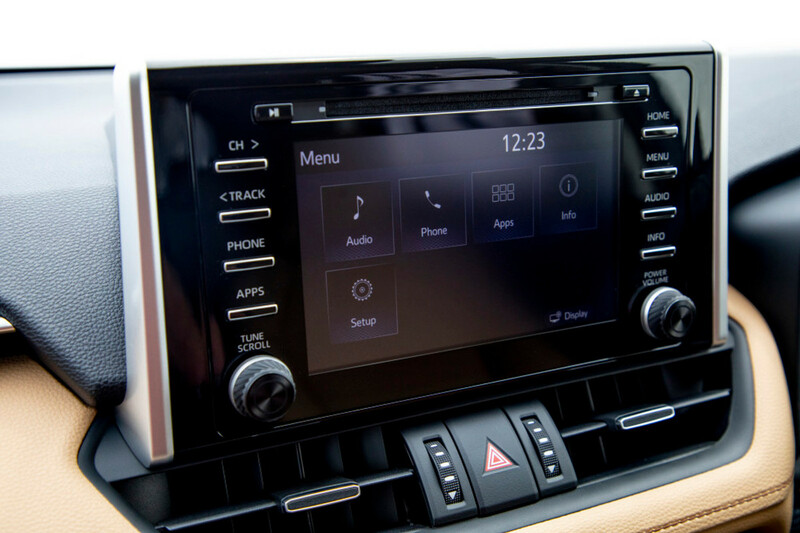 The top-spec RAV4 2.5 VX benefits from a surround view camera as well. 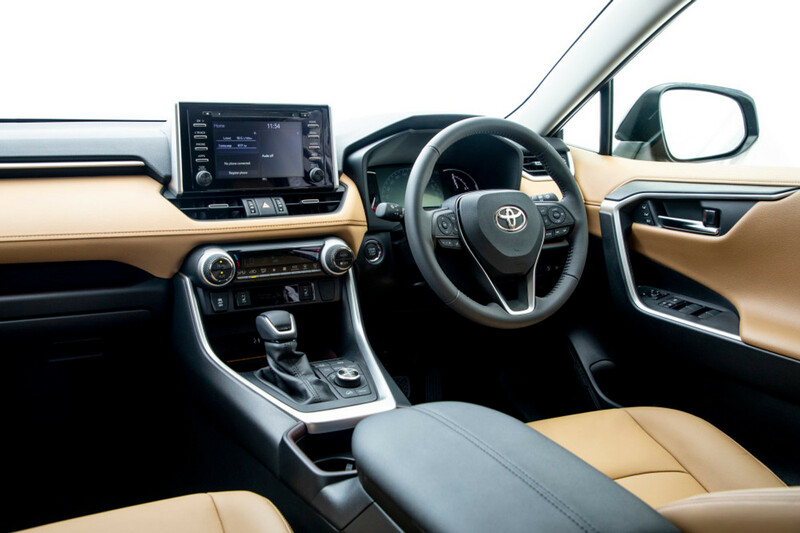 Toyota Safety Sense is now offered for the first time on the top-spec VX derivative and it includes features such as Adaptive Cruise Control (ACC), Lane Departure Alert (LDA) with Steering Control, Blind-Spot Monitor (BSM) and Pre-Crash System (PCS). The 60:40 split rear seats allow for maximum storage space and rear passengers are well catered for. Yes. There’s lots of space for passengers and luggage. The load bay offers 492 litres of space while the VX derivatives offer 572 litres. The rear seats can be folded flat to access more space for larger items if required. 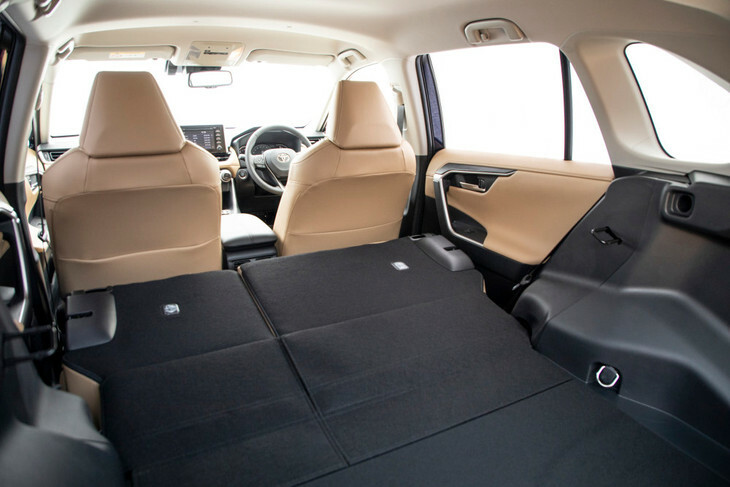 Rear space for passengers is good with ample legroom, headroom and should room. It’s rather comfortable back there, so long journeys should be a breeze. There’s also enough storage spaces dotted around the cabin. 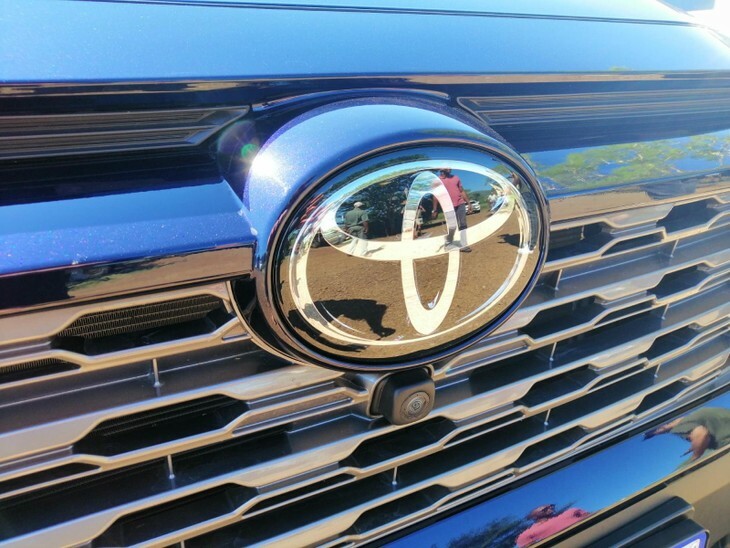 The RAV4's ride quality is a major highlight and it performs well overall. We sampled the RAV4 2.0 GX-R AWD and top spec RAV4 2.5 VX AWD at launch, covering roughly 280 km on both road and gravel. The ride quality of this new RAV4 is mightily impressive and it delivers high levels of driving comfort. We were particularly impressed by its solid and direct feel, especially on gravel. At sea level, both engines performed well with good acceleration and transmission response. 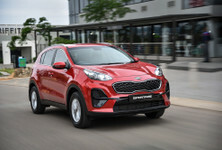 The CVT is good too but we were smitten with the 8-speed automatic which delivers smooth and near-imperceptible shifts. With a wider footprint, the new RAV4 feels planted on the road, giving the driver more confidence behind the wheel. Overall, we think the new RAV4 delivers an excellent drive. We achieved reasonable consumption figures on our drive too, with the RAV4 GX-R returning 7.6 L/100km and the RAV4 VX AWD returning 8.4 L/100km. 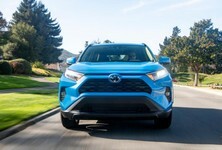 Should you consider the new RAV4? The RAV4 makes a very compelling case for itself in the family car segment and is well-worth considering. If you are in the market for a practical and comfortable family car, then we think the RAV4 should definitely feature on your hit list. 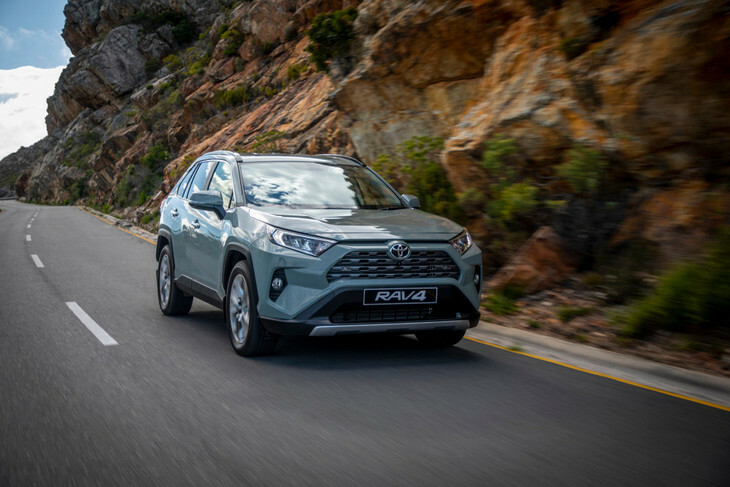 The price range for the new RAV4 is broad, starting at R416 400 for the RAV4 2.0 GX manual and going up to R577 900 for the top-spec RAV4 2.5 VX AT AWD, so there is a RAV4 to suit not only your budget but your needs too. 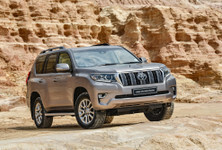 The front-wheel-drive derivatives are perfect for use in the city while the all-wheel-drive derivatives will appeal to those looking for improved ability to tackle gravel and more challenging terrains. 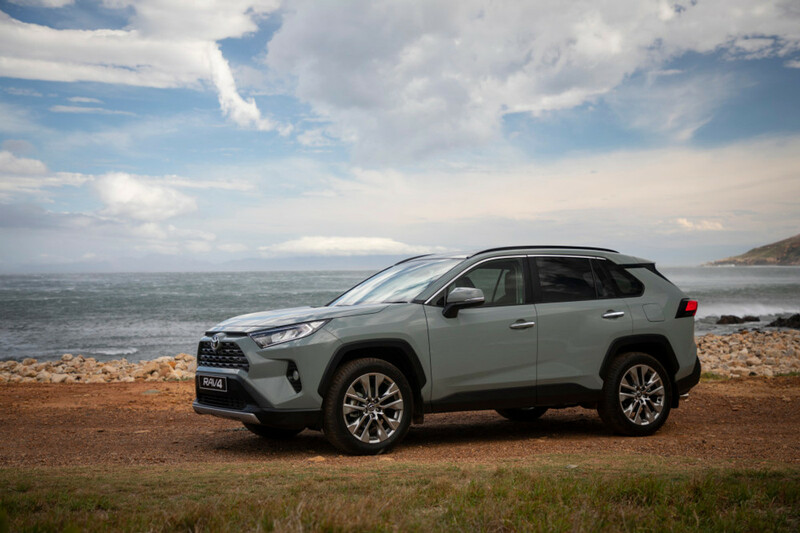 With its bolder styling, the RAV4 is expected to sell very well in South Africa and will certainly tempt many buyers away from the major players in this segment such as the Hyundai Tucson, Volkswagen Tiguan and Mazda CX-5. This new RAV4 has a lot going for it and we look forward to testing it thoroughly in the near future. The RAV4 is sold with a 3-year/100 000 km warranty and a 6-year/90 000 km service plan.